A little while back, I was delighted to be asked by Barbara to join the fabulous Design Team at Little Miss Muffet Stamps. Of course, keeping it quiet has been difficult so I've had to resort to some Intensive Curtain Twitching to keep me out of mischief. Ooh, the things that go on in my street! My neighbours obviously don't realise they have a Highly Trained Surveillance Operative living amongst them. You should've seen how quickly Very Understanding Hubby dropped the remote control when I told him that our neighbour (you know, the hot, skinny, blonde one with questionable occupation) had all her friends out in the back garden. 'Whoosh' doesn't seem to do the speed justice. But anyway, I'm off on a Fluffie tangent. I'll tell you about the neighbour who likes to cook 'A La Mode' another day. So there's a new Challenge over at Little Miss Muffet Stamps today and the Design Team have some cracking creations to get you inspired. What's it all about? Well, Outside the Die Cut. We'd like to see a part of your image peeping outside the Die Cut. Simples. I've used Monster Winds from the Monster Mash Range. This adorable little guy is just perfect for this technique, don't you think? And yep, I'm still into clouds and doodling right now. But don't worry, spots and stars return later in the week. The Sweet Stop - Sketch which I've Rotated and Mirrored!! wow Faye...this is gorgeous...love the little clouds!! WOWZERS this is awesome!! I love the 'out of the die' and this image is perfect for it as you say. Love the doodling - it loos ace! I also love to read your posts - they always make me giggle - what a great start to the day - thanks. Ha Ha Faye, could this card contain a "Monster" with a kite!!!!!! Wow a fab little boys card. Love the clouds and detail. Congrats on your new DT position sweetie. 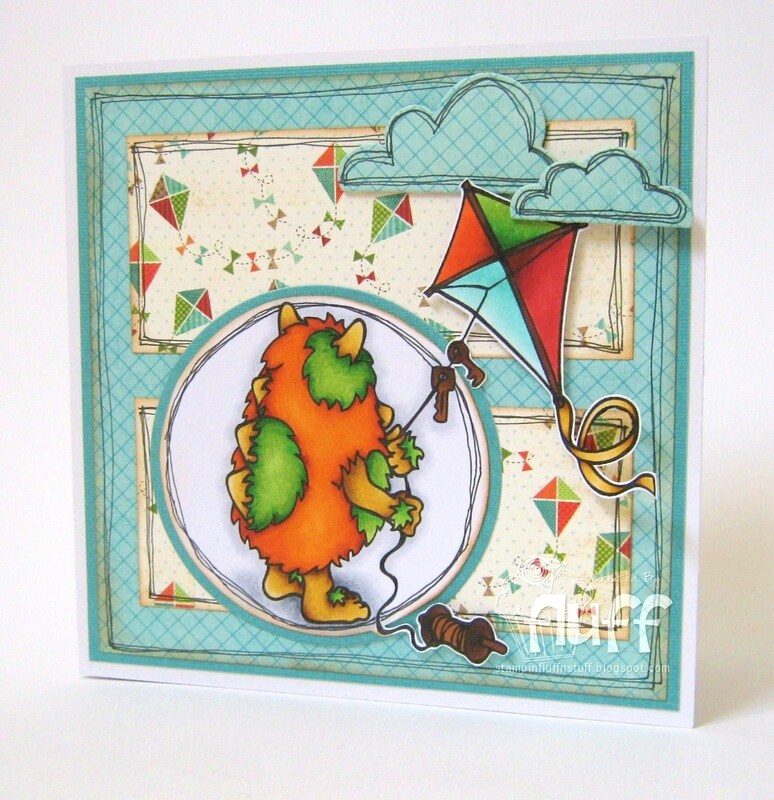 Gorgeous card love the image & love the kite coming out of the die-cut. Fabulosis!!! Absolutly Fab card! Just Love that little monster!! A big congrats on beeing a new DT sweetie!!! Hugs & Sunshine! This is nothing but STINKIN CUTE! Love the colors, even the little keys on his string is fun! Did you have to pass a special test to be let into your neighborhood? Like "if normal do not apply"? Brilliant card Faye, I love the monster, the kite and your cloud, fab papers too. Adorable Faye! Love the papers and the cute image! Definitely great minds. heehee I love everything about this card! The paper, the way you've traced the edges of the elements, the coloring! Great job chica! Awesome card Faye! Welcome to the team! I love the paper and the doodling and your colouring is fab! Sounds like you have some awfully interesting neighbours! I wish ours were as interesting! doodling = love it, clouds = love them, image = love it, papers = spot on, card = amazing! congrats on your new DT position, personally I think you should be on every DT cos your cards are perfick. 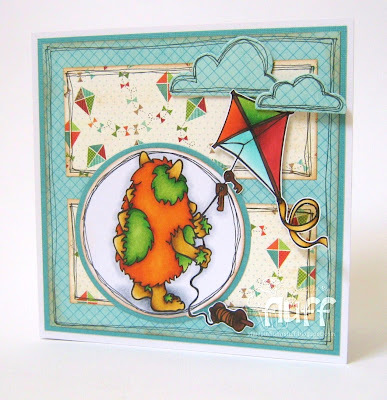 Oh I love that little monster:)Thank you for Joining us this week for Anything goes at Craft Your Passion Challenges. Good Luck and have a wonderful week. Congrats on the DT spot! Love your little monster card - just too, too cute. Fabaroony Faye..! great image and layout hun...and you soooo make me lol..! You're so brave for doodling! I hope I can feel that brave and try doodling soon too. Hope your mojo comes back refreshed! Mine is still on vacation but I feel it getting closer! I love every single thing about this card. Its just excellent. I really enjoyed reading your blog and become a follower. Have you been taking a Masters Degree in Clouding? It's a super duper effect. Which neighbour? I'm on the next fast train. Muver. Hi Faye this is fabulous what a great image I love those papers and the colours a super card. What a really fun card. Love your take on the sketch. Thanks for joining us at the Sweet Stop. Gorgeous card and wonderful colours. Thanks for joining us at CYDA this time. What a fabulous card! Love the fun image and your take on the sketch.Thanks for joining us at The Sweet Stop this week. Love this card, bright and cheery! Just about right for the holiday's! Congrats on Dt post and loving your cute super cute card. I just love your card! It's so sweet! Too cute! I love the 3D clouds. OK now that's out of the way I want more dirt on the neighbour side of your life, can't wait to read about ... cook 'A La Mode'!!!! Seriously lovely to be working with you all your work is tremendous. BIG smile.... what a funny image! The layout and DP are perfection.